FDNY firefighter John Martinson tribute. ArtAID and the Patrick J. Brown Memorial Foundation collaborate to provide a beautiful tribute for a fallen firefighter. One of FDNY's Bravest is lost looking for survivors in fire. 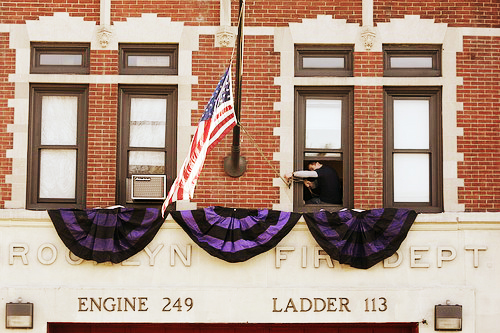 CROWN HEIGHTS BROOKLYN, NY -- January 3, 2008: The New Year starts on a somber note with the loss of firefighter Lt. John H. Martinson of E249 FDNY, 40, a decorated former NYPD cop, went into cardiac arrest in after entering smoke-filled 14th-floor unit at the Ebbets Field Apartments in Crown Heights looking for survivors. 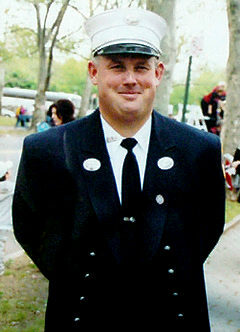 Once again, the FDNY Captain Patrick J. 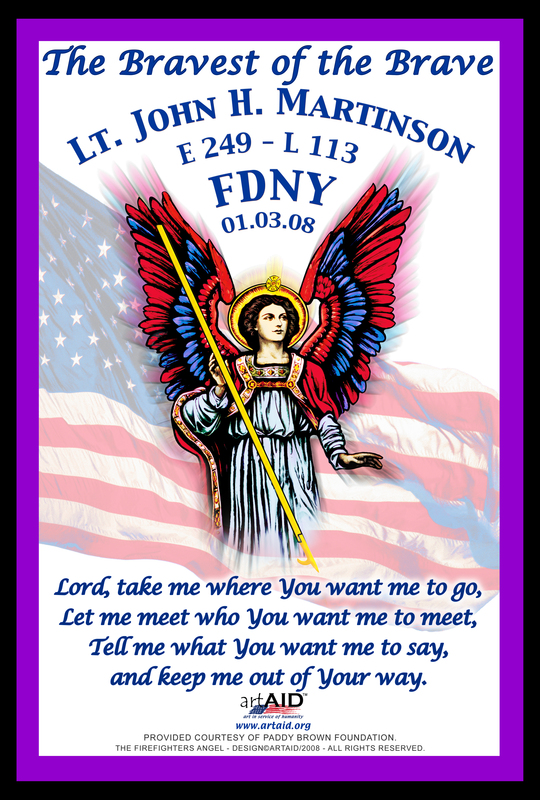 Brown Foundation commissions a personalized ArtAID Firefighters Angel to honor this brave individual who made the supreme sacrifice for the hope of saving a life. See more on this story here. 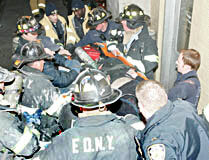 FDNY brothers carry stretcher from scene. 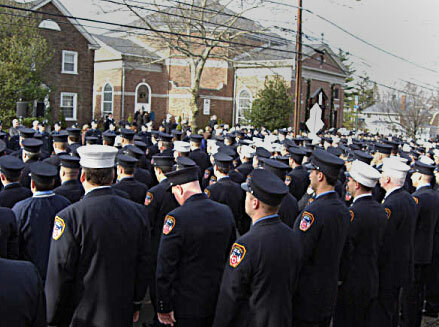 Thousands of firefighters from across the country gathered for the funeral of Lt. John H. Martinson, a veteran New York firefighter, to honor the man several called "Johnny Nice Guy." "We lost a real class act," said Lt. George Reese, who said he worked with Martinson for seven years. "This was John's life, John's love. He was always the first one to help out." Martinson was the first firefighter to enter the 25-story building on the former site of Ebbets Field. Martinson, 40, of Staten Island was later found lying on the floor of an apartment on the 14th floor, and was taken to Kings County Hospital Center. The fire started when a 6-year-old boy put wrapping paper on top of burners of a gas stove being used to heat the apartment, fire officials said. When the paper caught fire, the boy grabbed the burning trash and hid it underneath his bed, officials said. Neither the boy nor his mother was injured. The city medical examiner's office said Martinson died of smoke inhalation and thermal burns. Martinson is survived by his pregnant wife, Jessica, and their 22-month-old son, John Patrick. Friends and colleagues remembered him yesterday as a hero and a giver, willing to help out anyone in need. "He would give the shirt off his back for anybody," said John Castro, 38, who called Martinson a childhood friend. "I'm going to miss him." "He was a great guy," she said. "There are no words to describe how horrible it is." By Johathan Starkey with staff writer Steve Ritea contributing to this story.